A lot of cars died in 2017. For some, they will be dearly missed; for others, this was probably for the best. While everyone else is making lists of resolutions and what they plan to accomplish in 2018, and because death awaits us all in the end, let’s say farewell to the cars that won’t make it that far. This is as comprehensive a list as we could muster. 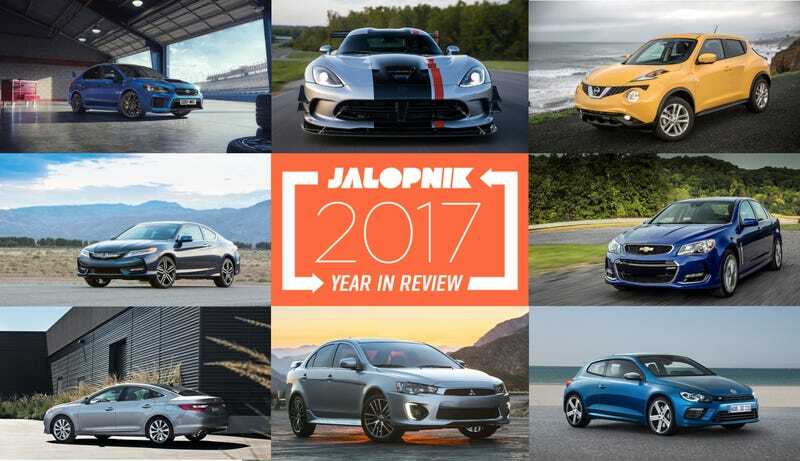 In addition, 2017 was the year we said goodbye to the: Buick Verano, because of crossovers; Infiniti QX70, which will be replaced by the QX50 and we’ll really only remember for that time a person in Illinois set theirs on fire with a flamethrower they bought online; Jeep Patriot, which got lumped into the Compass for 2018; Volkswagen CC, replaced by the funny-sounding Arteon; and the Mercedes-Benz B-Class Electric Drive. Oh, the poor, seemingly unkillable Mitsubishi Lancer. Mitsubishi, confused and unsure of what it’s good at anymore, both killed the road-legal rally car for the masses and brought back the Eclipse name as a crossover this year. The Lancer will live on in China and Taiwan in a slightly different form, but that doesn’t make this world any less terrible. Either the machines or the crossovers will kill us first, but either way, it will not be pleasant. The Chrysler 200 will be slightly less missed, with sales dropping and dropping in 2016. Prices dropped, too, with full lists of new 200s going for more than $10,000 under their $25,000 MSRP. What was once meant to signal Chrysler’s big comeback in the sedan market died a sad death this year. It actually wasn’t a bad car, honestly. It just wasn’t as competitive as it could have been in a tough segment, and it came out right when sedans were getting murdered by crossovers. Much to our eternal chagrin, Volkswagen Scirocco never went on sale in the U.S., but it died a sad death nonetheless. The sporty little hatchback was based on the Mark V Golf that ran from the mid to late 2000s, which put it behind the current Golf and GTI in terms of technology. But now the Scirocco is no longer behind, it is dead. In a couple of decades, it’ll be new to us in America, if the robots or any other unforeseen forces haven’t wiped us out yet. We look forward to importing one in 25 years. This one was confusing. First, why kill the Subaru WRX STI? What did it do to hurt anybody, other than being a road car with the soul of a rally car? How is that so wrong? Then, Subaru Europe’s sales and marketing general manager told a website the car would be “temporarily dead” in Europe due to that aging engine under its hood. We’ll see what that means for the future. The Mitsubishi i-MiEV would like you to say something nice at its funeral, but the problem is you probably aren’t even sure how to announce its name. It was a tiny electric vehicle with a nearly $30,000 starting price, and, notably, it could get to 60 mph in 13 seconds—a slow, slow 13 seconds. Mitsubishi discontinued it due to slow sales. Also, don’t worry about not knowing how to pronounce the i-MiEV’s name, if that’s the case. With its whopping 66 horsepower, you could outrun it in... most other things. Americans love crossovers and SUVs more than they love their own children, probably. The exception has been the Volkswagen Touareg, which was expensive and smaller than it should’ve been, and therefore didn’t compete well in the oversaturated market. Shame, as under the skin the Touareg was actually kind of an interesting car, owing to its shared platform with the Porsche Cayenne. Thus, the Touareg is dead in America. It’s one of the few crossovers/SUVs we can actually say that about. The new 2018 Honda Accord, as solid and good as it may be, debuted missing a very important feature: a two-door version. The Accord coupe was part of Honda’s lineup for decades, only to be axed in an era when coupes just aren’t able to stay as relevant as they have in the past. The reason for that struggle is rather shocking and unexpected: crossovers. Four doors it is then, Honda. Along with the coupe, the V6 option for the Honda Accord died. It was long the sole way to get more power than the four-cylinder engine out of the Accord, with Honda offering a V6 option since 1995. That ended with the 2018 model year. The outgoing Accord V6 was a 3.5-liter engine that made 278 horsepower, and it got replaced by the 2.0-liter turbocharged four-cylinder engine derived from the Honda Civic Type R as the higher engine trim. Turbos are good, but nothing replaces displacement, and the V6 in the Accord was long a solid everyday powerplant. It will be missed. The Lexus CT200h was a hybrid hatchback that didn’t get much love, with Lexus selling less than 9,000 of them in 2016. Lexus is phasing the car out of the American market while keeping it alive elsewhere. The CT200h started at around $31,000, and was a great Prius for people who didn’t want to drive a Prius. In the future, it’ll just be a great used Prius for people who don’t want to drive a Prius. The Azera was a luxury Hyundai sedan, but Hyundai decided to make an entire luxury brand full of luxury sedans, so its death was predictable. There wasn’t much that stood out about its looks, and as our Justin Westbrook pointed out in announcing its death, “Azera” sounds a bit like an allergy medicine. Ah, well. Hyundai seems to understand this luxury thing a bit more with its Genesis brand. The cars also look better than this one did. The Chevrolet Bolt took over Chevy’s main EV title, leaving the Spark behind in terms of range and price. While the Spark had a claimed range of 82 miles and an MSRP of $26,000, the Bolt upped it to a claimed 200 miles at $30,000. With those numbers, it just didn’t make sense to buy the Spark anymore. The Spark came around in 2013, meaning it just barely made it out of the toddler years. We can hear it crying now. As much of a surprise as it might be, Kia still made a two-door Forte with some weird and poor spelling as of this year. The Kia Forte Koup even had a Honda Civic Si competitor, the Koup SX, which had a 1.6-liter turbo engine that made 201 horsepower and a six-speed manual. It retailed for about $22,000, but new ones could be purchased for $15,000 or so near the time of its death. Perhaps people would have been able to find it more easily if it fell under the “coupe” category instead. The Juke was weird-looking, no matter how much power tuners could send to the car. Some would even say it was ugly. Our Jason Torchinsky liked the car, so it had that going for it. But Nissan betrayed Jason and traded ugly for boring, just as he pleaded the company not to do. The 2018 Nissan Kicks crossover will take its place, full of bland crossover-related poison in addition to 1.6-liter four-cylinder engine that makes 125 horsepower with a CVT. This is what nightmares are made of. We are living in hell. The Dodge Viper—which never got enough love, much like other discontinued cars on this list—died after the 2017 model year as well. The Viper just never sells unless it’s dying, and it’s dead after this year. Dodge said goodbye to the Viper with a final, extreme version it called the ACR—a race car made by racers, as described by a race-car driver. So long, Viper. We’re sorry more people didn’t buy you, but surely they will in the future when they all realize their mistakes. The sales numbers on the SS were terrible, and GM decided to kill the car along with Holden’s Australian manufacturing. That meant the death of NASCAR’s Chevy SS, too, which was always a fun and quirky hat tip to the Australians. The six-cylinder Mustang was long the everyperson’s choice, for those who wanted Mustang looks but didn’t necessarily care too much about Mustang performance. That changed in later years when the V6 got a very respectable 305 horsepower, and was fast enough to rival most V8 Mustangs from the past. But it was eventually consigned to rental car fleets as the 2.3-liter turbo four took on the bulk of the non-V8 sales, and eventually it had to meet its end. It was a good engine, but no one can escape the downsizing, forced induction monster. This year really was terrible. Onto the next one, everybody. This story has been updated to reflect that the Chevrolet SS eventually got a manual gearbox, and to add the death of the Ford Mustang V6.